If you are unsure how to use a ‘Péage’ /Toll Booth, check out this weblink. Take the D46, towards Bergerac, to pass under the big railway viaduct. This road number then turns into the D57 within 1 km / ½ mile. After about 5 miles (8 km), you will arrive in Vézac. Turn left (still on the D57) towards Castelnaud/Daglan. After 1 mile (1,5 km), you meet the D703, turn left onto it, then directly right to take you across the Dordogne and into Castelnaud-La-Chapelle. The D57 then leaves Castelnaud (towards Saint-Cybranet/Daglan) bearing to the left (heading up the Céou valley). After 2½ miles (4 km), you will arrive in Saint-Cybranet. Go through the village, towards Cénac/Domme. After crossing the Céou river, the road bears right. La Belle Demeure has a blue sign and is on the bend, the house before last on the left. It is the only one without a gate. Pull into our little courtyard so you can unload your car. Once you are settled in, you can then park your car in our field over the road. Leave the A20 Sortie/Exit 55 (towards Sarlat) taking the D804 (which will soon become the D703). After 12½ miles (20 km), leave the road to Sarlat off to your right and turn left to continue along the D703. This is sign-posted La Roque Gageac/Bergerac for 7 miles (11½km) (passing Carsac, Cingle de Montfort) until you turn left in Vitrac Port. If you have 5 minutes to spare, 1 km out of Carsac, pull off into the parking spot on your right at the top of the hill. From here you can admire the Cingle de Montfort & Monfort Castle. After turning left in Vitrac, you will continue for about another 2 miles (3 km) where you will see the road for La Roque Gageac turn off to your right, but you should use the D46 to continue on into Cénac, crossing the Dordogne. In Cénac, about 300 yards/metres after crossing the river, there is a cross roads (Bar Pauly café is on your left). Left would take you up to Domme, but you should turn right to take the D50, towards Saint Cybranet, climbing up and over the hill for about 3 miles (5 km). 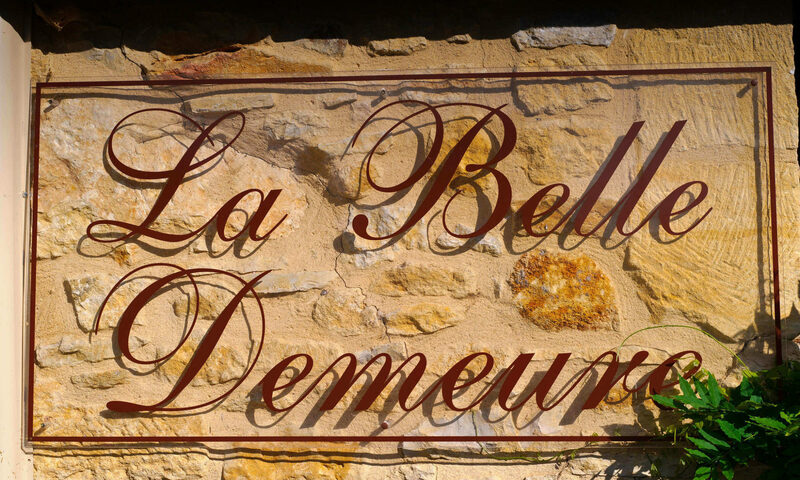 La Belle Demeure is the 2nd house on your right after passing the Saint Cybranet village sign. It is the only one without a gate and with a blue sign outside. Pull into our little courtyard so you can unload your car. Once you are settled in, you can then park your car in our field over the road. 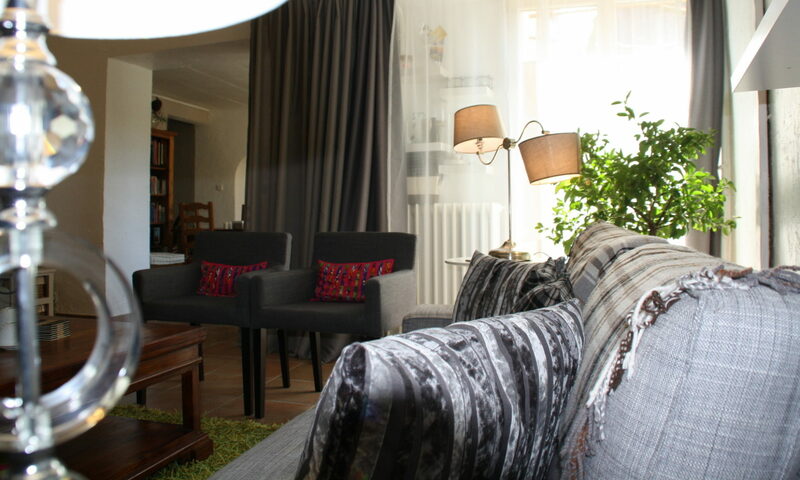 Whether you are coming from the airport at Blagnac, or the town centre, you will need to leave Toulouse on the A62/E9/E72 Autoroute/Motorway, towards Bordeaux and Paris. This is not a free motorway, so expect to pay about 10 €uros in total. Part of it as you approach Montauban & then again as you leave the A20 north of Cahors. About 21 miles (34 km) from the first ‘Péage’ /Toll Booth after leaving Toulouse, you will need to fork off right taking the A20/E9 northwards, towards Montauban, Cahors, Brive and Paris. Stay on the A20 leaving at Sortie/Exit 57 (north of Cahors) on the D49. There you will find signs directing you onto the D820 (the old N20) for about 20 km and then the D704 where you will reach Gourdon 7½ miles (12 km) later. Once in Gourdon, take the D673 through the town’s one-way system. Continue on the D673, and as you are leaving Gourdon, turn left at the mini-roundabout following the signs for Fumel. Do not take the D704 towards Périgueux & Sarlat as this will take you round the houses quite a bit. Continue for about 5½ miles (9 km). Turn right onto the D6 (becoming the D46 once you leave the Lot department and enter the Dordogne) for a further 9 miles (15 km) until you reach Cénac, just south of the Dordogne river. Before completely leaving the village, there is a crossroads (just after a boulangerie on your left). Less than 5 minutes to go! Turning right would take you up to Domme, but you should turn sharp left to take the D50, towards Saint Cybranet, climbing up and over the hill for about 3 miles (5 km). If, in Cénac, you cross the Dordogne river, you have gone too far! – so turn round somewhere safe, cross the river again and get ready to turn right onto the D50 towards St Cybranet! Once you leave the airport, turn right onto the main road (N21), then right again at the roundabout onto the N21 (signposted Périgueux/Cahors/Sarlat). After crossing the Dordogne river, take the right turning off the roundabout onto the D660 (towards Sarlat). There is a petrol station here, which may be useful to you on your way back before dropping off the car. This road number will change several times and you will cross the Dordogne river at Lalinde (just after you have gone through the village centre, there is a sharp turn right to take you over the bridge) and also just before St-Cyprien. Keep heading towards Sarlat passing through Lalinde, Le Buisson, Siorac-en-Périgord and Saint Cyprien. Eventually you arrive in Beynac. Once out of Beynac, you will go under a railway bridge, and then you will turn immediately right (towards Castelnaud /Daglan). After about ½ mile (1km), turn right onto the D57 heading towards Castelnaud, and crossing the Dordogne river. The D57 then leaves Castelnaud (towards Saint Cybranet/Daglan) bearing to the left (heading up the Céou valley). 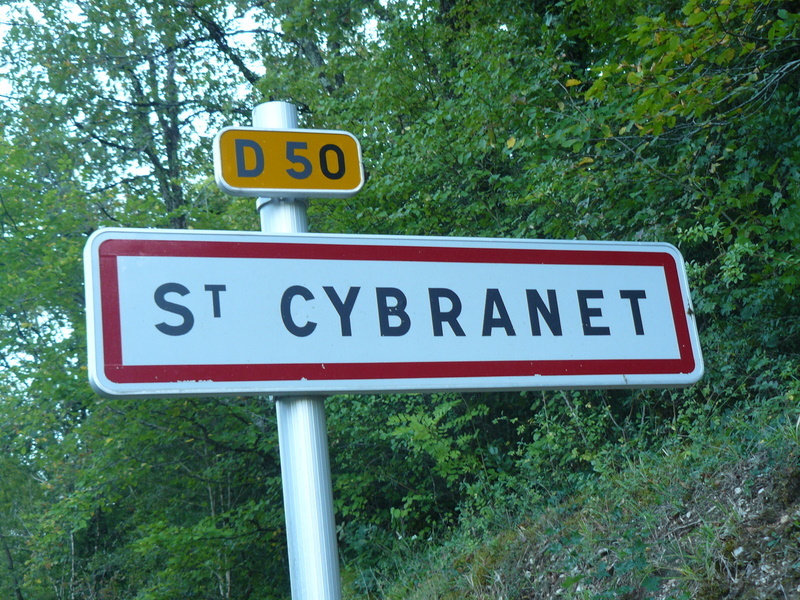 After 2½ miles (4 km), you will arrive in Saint Cybranet. Go through the village (towards Cénac/Domme). After crossing the Céou river, the road bears right. La Belle Demeure is on this bend. It is the house-before-last on the left hand-side. The only one without a gate and with a blue sign outside. Pull into our little courtyard so you can unload your car. Once you are settled in, you can then park your car in our field over the road. Take the N2089 south-east out of Périgueux (towards Brive) and passing the junction for the A89 motorway. About 1 mile after going under the A89, you will reach a roundabout where you should take the D710 off to the right (towards Sarlat/Les Eyzies and Espagne/Toulouse Bis). After 9 miles (15 km), the road for Les Eyzies and Sarlat forks off to your left, but you should continue on the D710, following directions for Le Bugue and Espagne/Toulouse Bis. Once you reach Le Bugue’s one-way system (after a further 10½ miles/17 km), go all the way through the village towards Campagne. Do not cross the bridge over the Vézère river in the middle of the town. Further down this road, you will cross the Vézère river, to enter the village of Campagne. Within a few hundred metres, bear off right onto the D35 to drive the 6 miles (10 km) up and over the hill into St- Cyprien-keep an eye out at the top of the hill for the turning right for the 2 mile, (3½ km) rather bumpy, descent into St Cyprien. Keep going straight on, avoiding the middle of St Cyprien and its one-way street, until you reach the main D703 road where you will turn left (towards Sarlat). After 6 miles (10 km), you will reach Beynac. Less than 10 minutes to go! Once you have passed through Beynac, you will go under a low railway bridge, where you will turn immediately right (towards Castelnaud/Daglan/La Roque Gageac). After about ½ mile (1 km), turn right onto the D57 crossing the Dordogne river and heading into Castelnaud La Chapelle. The D57 then leaves Castelnaud (towards Saint Cybranet/Daglan) bearing to the left heading up the Céou valley. After 2½ miles (4 km), you will arrive in Saint Cybranet. Go through the village (towards Cénac/Domme). After crossing the Céou river, the road bears right. Upon leaving Calais, follow Boulogne and Rouen on the A16 going South. Some, but not all of this itinerary, are toll roads, so expect to pay about 25 €uros in total at various spots along the journey. At Abbeville, turn off the A16 at Junction/Sortie 23 to take the A28 to Rouen. After having passed through the tunnel on the approaches to Rouen, follow signs for Paris on the A13. Stay on the A13 for about 14 km, and then turn off onto the N154 to Evreux and Orleans. Carry on past Evreux & Dreux. Go around Chartres then, on the N154, drive for another 30 km where you join the A10 north of Orleans. Then, it is just straight down on the A10 to the A71 onto Vierzon and then onto the A20 motorway, leaving it at Souillac Sortie/Exit 55 (Sarlat) just south of Brive. Cross Souillac following signs for Sarlat taking the D804 (which will soon become the D703). After 12½ miles (20 km), leave the road to Sarlat off to your right and turn left to continue along the D703 towards La Roque Gageac/Bergerac for 7 miles (11½km) (passing Carsac, Cingle de Montfort) until you turn left in Vitrac Port.